Managing a rental property is hard work. As a landlord, it is your obligation to provide tenants with a rent receipt when a rental payment is made. This proves that one’s dues were met accordingly in the event of a dispute. 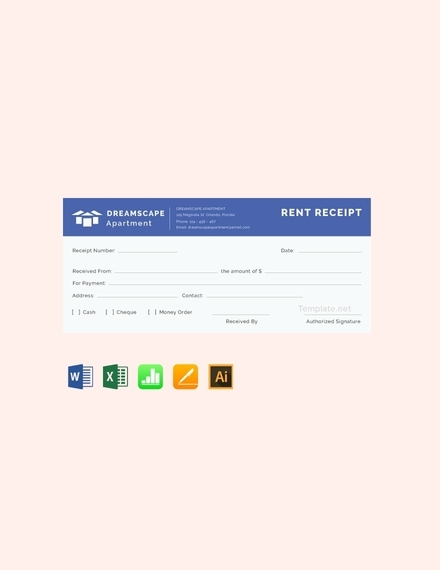 Since a receipt may vary in terms of content and structure, let’s dive deeper into the topic to learn how rent receipts are made. 1. Business Name and Address: At the top of every receipt you’ll find the name of the business that issued the receipt along with its corresponding address. Family-owned housing properties, on the other hand, often display the full name of the property owner instead. It’s important to have these elements clearly displayed so that any issues with the transaction may be settled with the right authorities. 2. Price and Services: The expense receipt should list the rented item with its agreed price beside it. Since it is possible for a tenant to be paying for other amenities such as water and electricity, a breakdown of such will be added to the receipt for recipients to be guided. This will likely take up the majority of the room on your rent receipt, so make sure these are listed clearly enough for clients to understand. 3. Subtotal, Taxes, and Total: At the bottom of the receipt, just below the list of items to be paid for, a subtotal category indicating the tentative amount due must be indicated. This reflects the total of your rental payment before taxes are applied. Under this should be the taxes section which shows the tax charged on your rentals. Finally, the total section will depict the final amount the tenant pays. 4. Transaction Record: Under the total amount lies a section which documents how much a person has paid, and what change (if any) was received. For tenants, this part can be referenced if improper change was ever given. The transaction number can also be valuable to address a possible dispute in the near future. 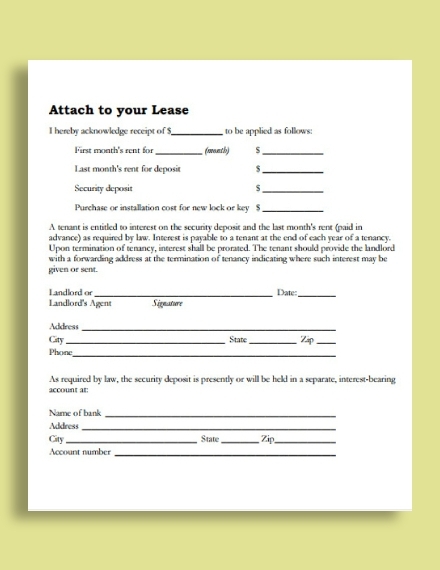 You may also see lease receipt examples. 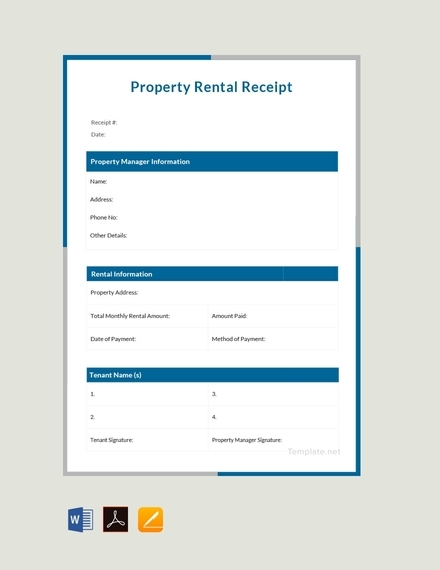 Rent receipts are only issued after a payment has been received. This is usually done on a monthly basis, and whether this can be done through cash or credit card would depend on the terms and method of payment agreed upon in your rental contract. Business receipts often share a similar format. 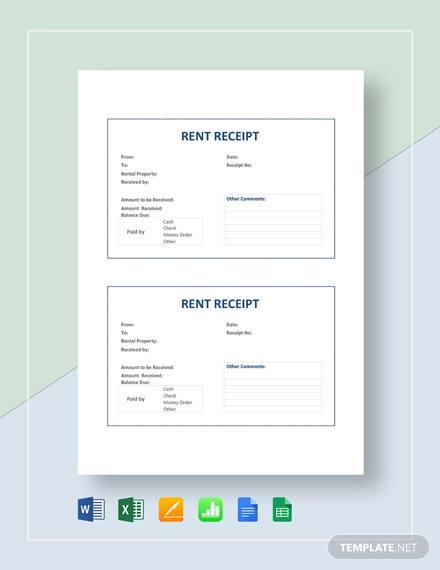 To save on time and effort, you can always use a template for your rent receipt instead. Be sure to fill out the document with the necessary information, including the date of payment, the tenant’s name and address, the total amount of payment, as well as the payment method (cash or credit). 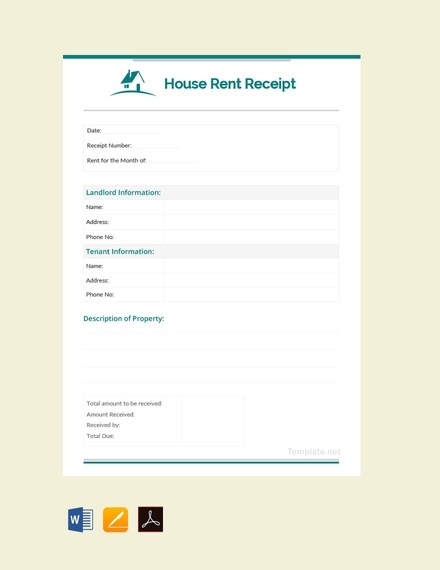 You can also purchase a rent receipt book and fill it out by hand as a manual alternative. Use a letterhead: While you may not be writing an actual letter, formal letterheads still carry key business information that clients might find useful. 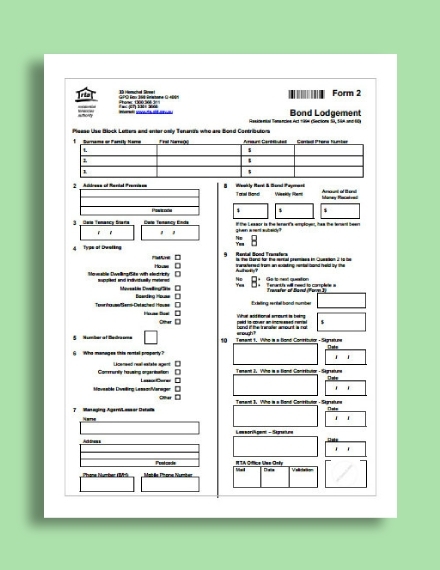 This contains a company’s name, address, contact details, and other relevant information. Your business logo may also be used to reinforce your brand even further. Choose an appropriate page orientation: Most receipts are portrait in form, especially when listing of items are required. There are also cases where a landscape orientation would be more suitable, particularly when images and large chunks of copy are needed. 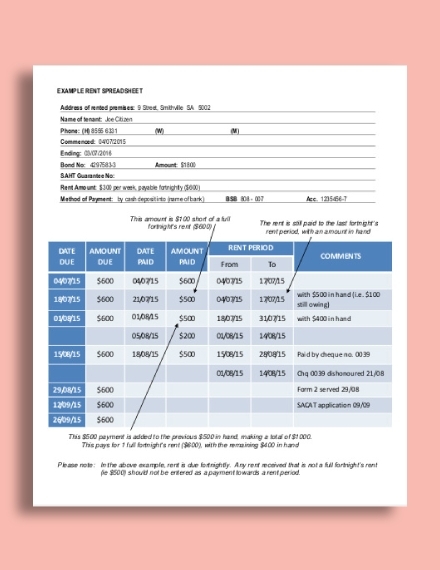 Include empty spaces if applicable: Even if it’s a printed receipt, there are instances when details need to be filled out by hand. For example, some receipts and invoices require the receiver’s signature at the bottom of the page. By leaving a blank space on the receipt, you can take down additional notes for when the situation calls for it. Keep it organized: Receipts that are hard to read are often misinterpreted by either tenants or landlords. This is one of the reasons why a computer-generated receipt is much preferred over a handwritten one. Aside from the box and lines to separate items, the proper application of white space can also help maintain an structured format. Make it readable: Most receipts contain a breakdown of one’s expenses. But since mistakes are bound to happen one way or another, clients may want to review the receipt for any discrepancies. Of course, this is nearly impossible to do if you make it difficult for readers to understand what the receipt says. Be sure to use simple statements and supporting details for proper delivery, and consider using headings and subheadings when necessary. Apartment, condo, dorm, and house rentals are quite common in real estate. People who plan to live in a particular state temporarily often rent a room or apartment in the heart of the city to live close to where they work or go to school. With the bills coming in every month, tenants may request for a rent receipt from their landlord to keep track of their monthly expenses. 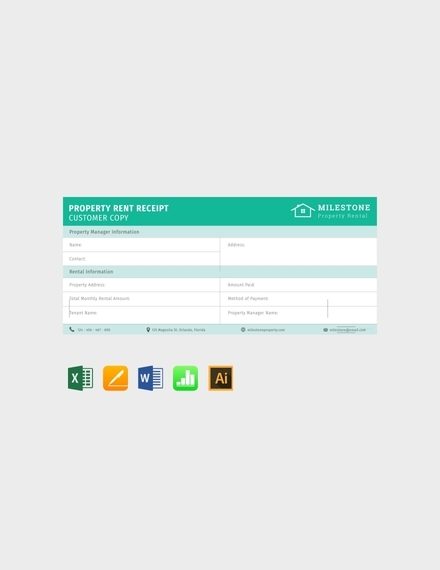 If you own an apartment complex or building, having your own copy of these receipts can be a valuable tool for effective management. The vendor stalls at the mall as well as the shops along the street are likely to be rentals. 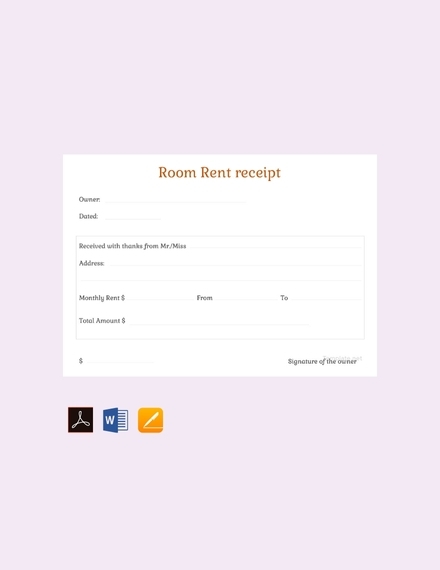 Given the significance of a receipt in a business transaction, establishment owners are required to issue a rent receipt to their tenants whenever a payment is received. The amount due may vary according to the size of the space being rented along with its exact location in the building. Rentals cars, or any vehicle for that matter, are a popular means of transportation in the modern age. This is a convenient way to get around without having to worry about the long lines and crowded spaces of public transport. However, renting a car does have its terms and conditions. Apart from a valid ID, renters may also be asked to make a down payment beforehand. 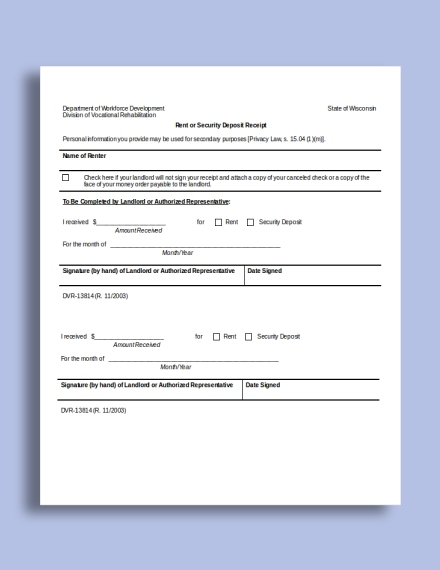 If the payments were settled through an online transaction, you may be required to present a digital or print copy of the receipt upon pickup. The receipt will prove that you have settled the payment in order to avail the offered services. Nearly everything can be rented these days. You can rent a surf board and a scuba gear from a shop at the beach, or you can even rent some camera equipment from a local shop to conduct your own shoot. Equipment rental receipts are extremely important to a business as this can help you track who and when certain materials were borrowed in case of damage or loss. 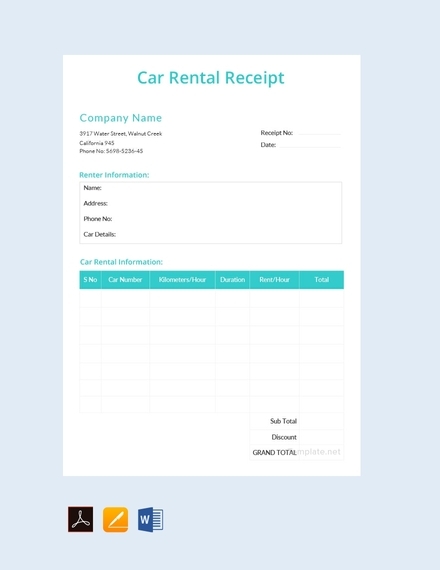 Customers can also use the receipt to prove that they have paid for the rental just in case advance payments are needed. 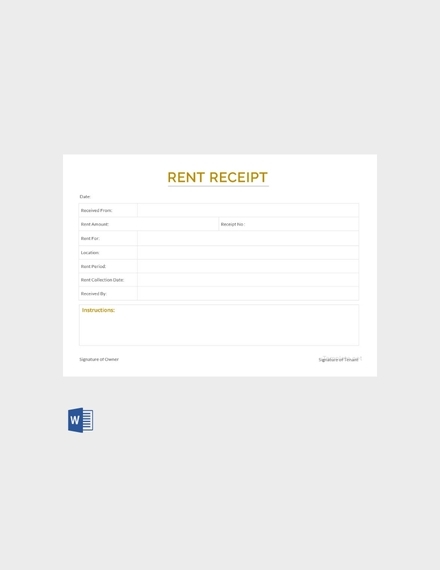 How can I make a rent receipt? Filling out a rent receipt with a pen every time a transaction was made might seem like a lot of work. Perhaps you can opt for a digital approach instead by downloading a receipt template online, editing its content, and printing it as needed. You can personalize the content of your receipt to suit industry and business requirements as well to make maintain the document’s credibility. What to include in a receipt? 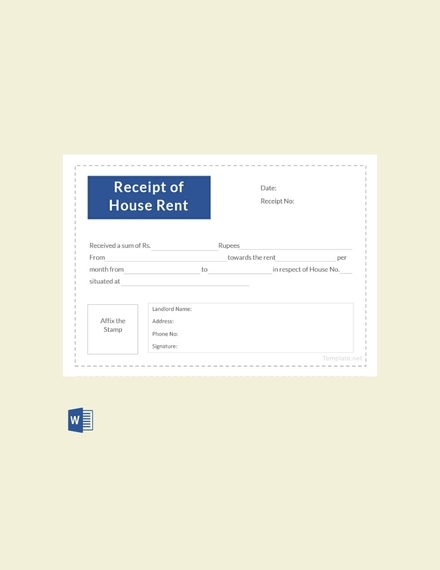 A rent receipt is a bill of payment issued by the landlord or landlady to a tenant of a house, apartment, trailer, or commercial space. 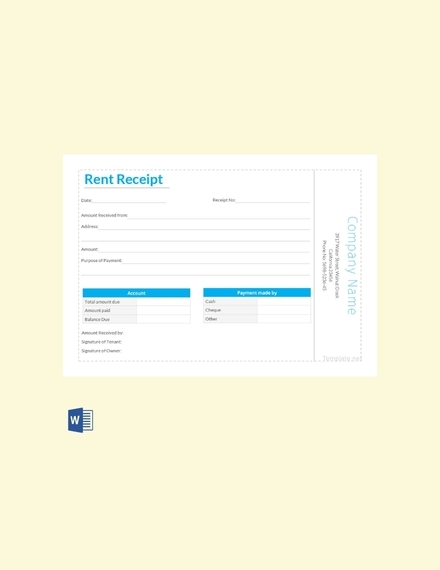 The format of the receipt includes the landlord’s name, renter’s name, address, price, start and end date, as well as the billing period of the payment. This must be stated clearly in the receipt to avoid any issues later on. 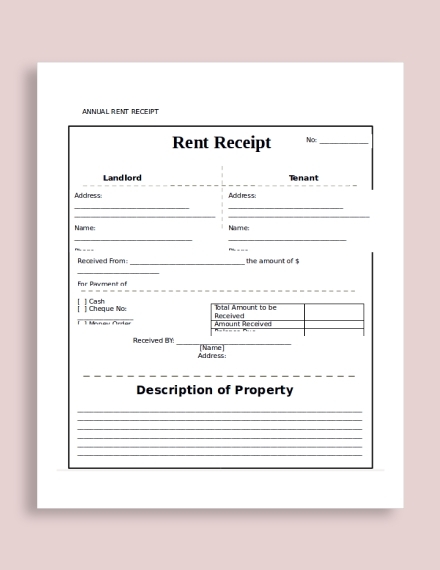 Why are rent receipts important? There’s practically a receipt for everything these days. There are many reasons why you must request for one for every rent payment made. If a problem arises later on, you may be asked to provide a receipt of payment if the matter goes to court one day. Some states even require landlords to provide a rent receipt for their clients to use as proof that they have paid their rent on time. To put it simply, a rent receipt is a valuable document that both the tenant and the landlord can benefit from. 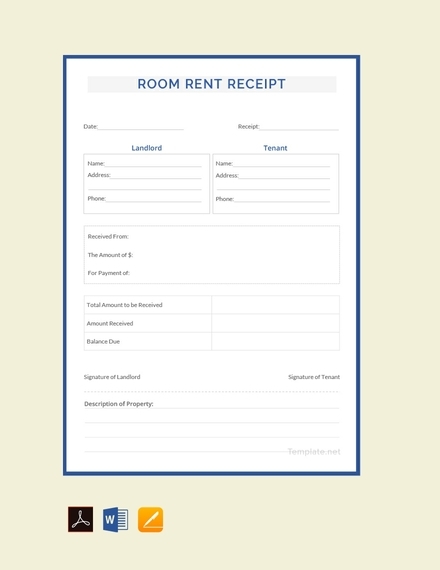 Now that we’ve covered the basics, you can provide your tenants and clients with a professional rent receipt with the help of these templates and examples!